Pozvani Ste! You are invited! The speaker, Br. Amer Bukvic’ , our alumnus from Bosnia and Herzegovina, graduated with a Bachelor Degree in Political Science in 1996. 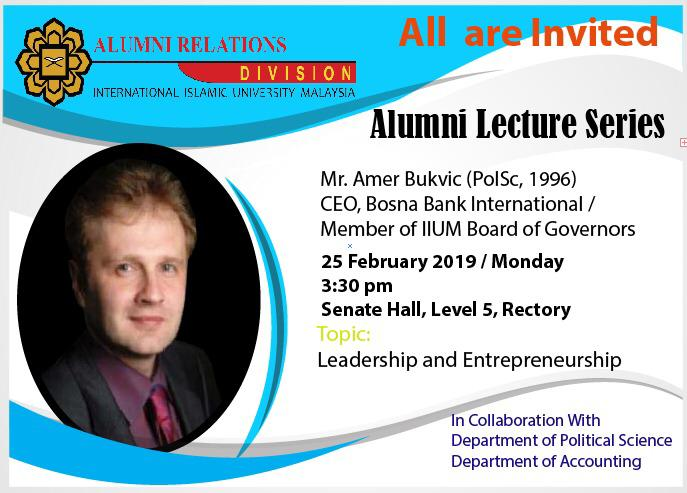 He is now the CEO of Bosna Bank International and member of IIUM Board of Governors. He was listed as one of the world's 50 most influential leaders in the Islamic economy according to "Islamica 500" for 2018. Hence, don't miss the opportunity to hear him share his experiences on Leadership and Entrepreneurship during the Lecture. "Islamica 500" is a business guide published annually, to provide hard-to-find biographical details for 500 of the world’s most prominent and influential personalities in the Islamic world and economy.